ETI offers various portable generators & packaged power solutions. • ETI's TacticalPower Plant® (TPP) can address global input and output voltages and frequencies (i.e. 120/220 VAC, 50, 60, 400 or 1000 Hz, 12, 24, 48, 72 or 125 VDC) allowing it to be deployed anywhere in the world and used with all electronic equipment and critical loads. • Built-in UPS/Power Conditioner cleans up an external source and produces continuous computer grade power: medical grade optional. • External fuel quick connect and management system to bring fuel from external sources. • Additional deployable fuel tanks available to provide from hours to several days of run time at full load without refueling. • Optional 12, 24, 48, 72 or 125 VDC Input with universal NATO Slave quick connection. • The Automatic Transfer Switch (ATS) automatically selects between multiple external sources or the internal generator. • Battery backup provides uninterrupted operation upon loss of external sources. • The bottom mounting tray slides out for easy access to the engine and generator. 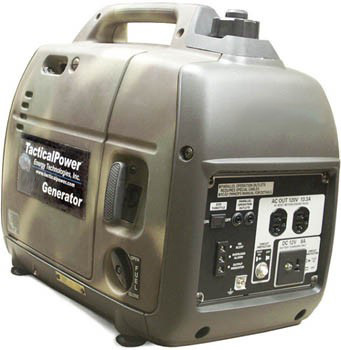 ETI's Tactical Generator® output is computer grade vs. most generators which produce noisy, unstable power less suitable for the reliable operation of electronic equipment. • Available in diesel, gasoline, natural gas or propane fueled versions. The Diesel and JP-8 fuels are preferred by Warfighters in the field because they are more readily available. • Internal fuel tank provides hours of operation at full load. 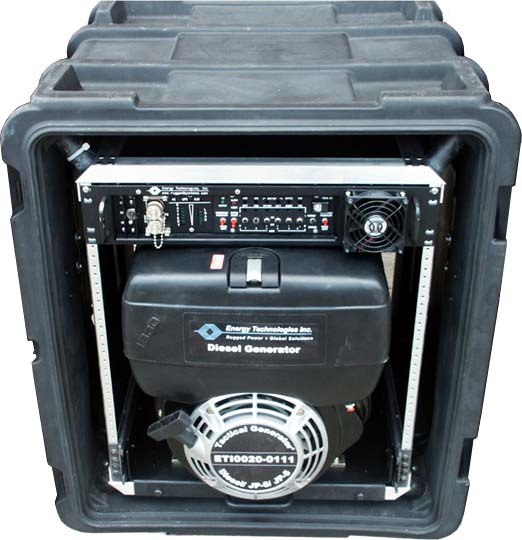 Optional transit cases with fuel bladders available in various capacities. • Quieter operation compared to most generators. • The small units are easily Man Portable. All sizes weigh less than traditional diesels. • Optional DC outputs for batteries or DC loads. • Available in open frame, skid or transit case versions. Transit case models available with open or closed door operation. ETI's offers a range of components to support our TacticalPowerPlants™ and Tactical Generators. • NATO Cables: Our NATO cables are classified as MTW (machine tool wire) which is composed of numerous fine strands allowing the cable can be easily manipulated. Available in a number of lengths and connection types. • Backpack and vehicle mountings to transport our generators in a number or ways. • Standard output is a true sinewave 120 VAC, 60 Hz, 1250 watts continuous duty. 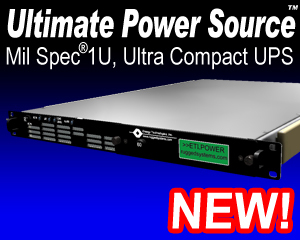 • Power rated from -25°F to 125°F and 100% humidity at 4000 feet elevation. •Internal fuel tanks provide hours of operation at full load. • Optional external fuel tanks and fuel pump to draw off from external fuel sources. •Multiple unit parallel operation capability.